Wondering which way to go next? History resonates. Paul was anxious to meet up with his friend Timothy and enjoy an extended visit with old friends in Corinth. He had every intention of spending some quality, unrushed time with them even though there were plenty of other things competing for his time and attention. For example, prolonged stays in Ephesus and Macedonia kept Paul from his visit to Corinth for well over a year. Do you ever feel like that? You want to go hang with friends or pursue some dream that excites you while there are other pressing matters all around? I sure relate! And it can be hard sometimes to discern which of those “pressing matters” are actually as important as I think they are. Sometimes I feel like it’s moment-by-moment battle to discern what to do next, where I should make some intentional decisions about priorities and when I simply need to press in and make the best of circumstances out of my control. Paul seemed to be a master at all of this kind of discernment and submission. He recognized a ripe opportunity right in front of him and was willing to wait a little longer to see his friends so that he could do the “great work” right where he was and resist moving on too quickly. Earlier this year when I was reading Paul’s letter to the Corinthians, this verse from 1 Corinthians 16:9 literally jumped off the page at me. Let me take a moment to tell you why. Since the beginning of Walk Right In Ministries (8 years this month), we have periodically asked the question: “Does God want this to be a ministry specific to people with disabilities or is He really moving us into a broad place to serve people facing a wide range of life challenges?” Our missions was clear (to help people connect and grow in Christ-centered community) and our general audience was clear (people feeling lonely or isolated and often existing on the fringes of the church). What was not always clear is to what degree God wanted our “audience” to be targeted and in what specific ways He wanted to us to reach out. Please pray for Walk Right In Ministries. These are exciting days. We are busy and we are focused. We sense God’s presence, power and good fruit is steadily growing where He has carefully placed us in positions of influence. Yet we hold plans loosely with the understanding that the Holy Spirit is dynamic and brilliant. We are anticipating surprises in 2017 and are already seeing some sweet ones on their way. Scroll to the end of this post for an announcement about COOL NEWS! for 2017. When was the last time you wrestled with God about whether you are fulfilling your purpose or correctly hearing His call? Perhaps you’re making it too complicated when God has actually put a wide open door right in front of you. Do you ever look around at what others are doing and feel guilty or envious? Consider that God doesn’t want you to experience pressure. He wants to give you joy in knowing He has appointed you for something unique and He wants you to experience the kind of spiritual rest that comes from simply embracing the doors He is opening right in front of you every day. Is this the time of year when you will begin wondering about how to invest yourself in 2017? We’re praying for you to have eyes to see and ears to hear when new doors open. What obstacles or opponents are you facing that may be tempting you to change directions when, in fact, God wants you to run straight ahead and trust Him to do a great work despite those challenges? If there is repentance to be done, do it. If there is forgiveness to be offered or reconciliation to be sought, extend it and seek it (whether it is received or not). To what extent might the very things that are challenging you right now (e.g., health crisis, stretched finances, strained relationships, job dissatisfaction) are actually part of what God is using to make your effectiveness more significant? 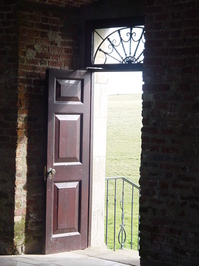 Does this Thanksgiving and Christmas season bring any “open doors” to your mind? What opportunities may be right in front of you where your involvement could produce a great effect? What joy lies before us when we embrace our current situations for all they are worth and trust God to cause tremendous Kingdom impact! This interactive session opens a dialogue about the challenges, disappointments, advantages and opportunities of being a sibling in a family affected by disability. It is led by Lisa Jamieson, the mother of three adult children and author of Finding Glory in the Thorns. Lisa is joined by her adult daughters Alex and Erin who share candid perspectives about growing up with a sibling who has Angelman Syndrome which involves chronic health issues and severe developmental disabilities. Discussion topics will include sibling conflict, balancing attention, grief processing, dealing with social stigmas and misunderstanding, family vacations and managing stress. Participants will leave encouraged with basic principles and numerous practical ideas about how to enjoy more victories and deeper graces despite the reality of weaknesses in every family. Lisa Jamieson is a national speaker, author, consultant and advocate who serves as executive director at Walk Right In Ministries and leads Minnesota’s Disability Ministry Connection. Her books include Finding Glory in the Thorns and Living Your Glory Story. She is also creator of the Finding Glory small group curriculum, a favorite of caregivers and others wanting Christ-centered discussion through challenges. Lisa and husband Larry have three adult daughters. Carly lives at home with Angelman Syndrome. Their story has been featured on Words to Live By, 100 Huntley Street and My Refuge Radio Belize. Alex Jamieson is a senior audit assistant at Deloitte (Minneapolis). Active in her church and as a community soccer coach, Alex also volunteers with Walk Right In Ministries as an occasional speaker and regular encourager to families experiencing special needs. She is the oldest sibling to a sister who has Angelman syndrome. During her high school years, Alex worked as a personal care assistant and has since become a strong advocate for her sister Carly and others who experience disabilities. In her blog “Authentically Alex,” she reflects on a range of topics from setting goals to dealing with life’s transitions. Erin Jamieson is a singer-songwriter and worship leader. Her songwriting, blogging and speaking is often inspired by challenges and insights experienced growing up in a family affected by disability. The title cut from her debut EP Without the Dark is featured in the movie Season of Miracles about a baseball player with autism. Erin is a senior at Belmont University in Nashville where she recently performed in the 2017 Christian Showcase. Her latest release No Dream Too Big is available on NoiseTrade. Erin’s youngest sister has Angelman Syndrome. This sounds like it will be a wonderful topic to listen too. I wish I could come up with the money, my church don't have a lot of money so I can't go to them for help with that. Previous Previous post: Together & Free: That’s a beautiful place to be!